As regular readers of my web site would know, Kelly and I spent six months of 2015 sailing from Sydney to northern Queensland and back. As part of this, we tried to dive as many places as we could. However, with only two on board for all but 1o days, the places we could safely dive were severely limited. One of the spots we wanted to visit was Lady Musgrave Island on the Great Barrier Reef. Kelly went there once about 2000 but I had never been there. Musgrave is located 55 nautical miles (102 kilometres) north of Bundaberg and about 35 miles (65 kilometres) from the small town of 1770 (where Lt James Cook, RN, landed in 1770). We sailed from Bundaberg which took most of the day. A satellite photograph of Lady Musgave Island and the lagoon showing our sailing track in from Bundaberg and out to 1770. 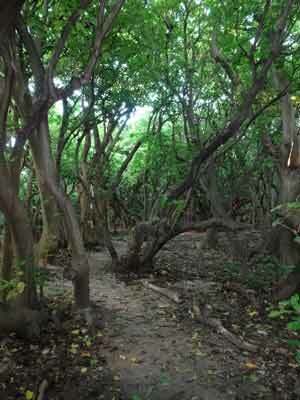 The island is quite small, only 700 metres long and 350 metres wide. 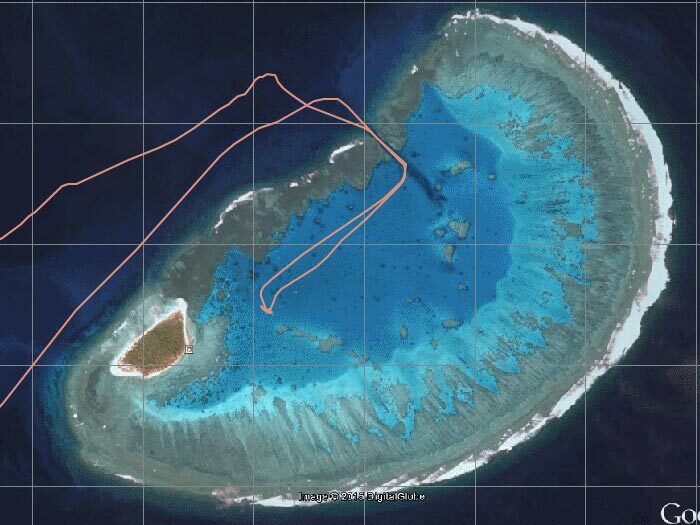 The island is located in the south-western corner of a coral atoll which is 5 kilometres long and 3 kilometres wide. The island and atoll run south-west to north-east. The usable section of the lagoon for large boats is huge, about 1.8 by 1.3 kilometres. Other than sailing there yourself, the only real way to visit is from 1770 on the large aluminium power catamaran that visits most days (limited by the tides at 1770 - cannot exit when very low tides). You can dive with them or take camping gear and a boat and stay on the island. Of course you would need a compressor as well. At least a few clubs used to do this, including DOUTS from Sydney. We ended up anchoring in the southern part of the lagoon near the tourist pontoon and island. There was a nice bommie near us, so we dived that first. It was not the sort of dive you would pay to do, since it was only 8 metres deep on the sand and 5 metres on the top. However, it was a good first dive for the trip since we had not dived for six weeks and I also wanted to scrub the hulls at the end of the dive. There are numerous spots you could dive outside the coral reef, the most popular being off the western side of the island where there is apparently a spot that manta rays are regularly seen. As there was only Kelly and myself, we decided to do some very conservative dives. 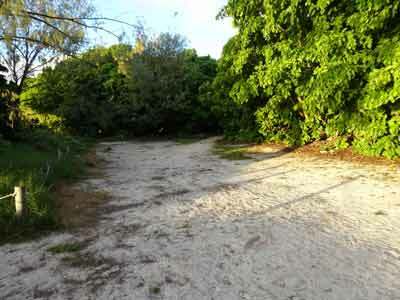 The entrance channel into the lagoon is quite narrow and is man-made (or at least greatly enhanced by man). The only way to dive this is as a drift dive. We decided to do it as a solo dive, first I would do it and then Kelly. However, on the day we were going to do the dive, Kelly had sinus problems so only I did it. We picked a time when the tide was rising so the water was running into the lagoon. I geared up and Kelly drove me in our 3.4 metre RIB (Thunderbbird 2) through the channel to the outside. You need quite a bit of horsepower to traverse the channel when the tide is really flowing, we have a 15 hp outboard. She dropped me on the southern side of the channel entrance into about 12 metres of water. The visibility was excellent and the water temperature over 24C in late May when I did this dive. The coral was quite nice and there was a lot of fish about. I slowly swam to the north-east till I could see the channel and then turned east. Soon I was being propelled along by the tidal flow. Wow, the speed was incredible, I guess that I was doing 3 to 4 knots, there is no way I could swim against it, not even hold my spot. Kelly followed me till here but then had to power through to the inside due to the current. The fishlife in the channel was amazing, quite a few turtles, lots of big fish including one huge cod or groper. The channel is about 350 metres long, so it does not take too long to travel its length. It would probably be best to try to dive about 30 minutes before high tide. There were also lots of anemones and clownfish, but of course I could not stop to look at them. They were on the sides of the channel and protected from the current. The depth was about 6 metres or so. Once inside the lagoon it deepens a bit to 10 metres. I then went south and found a large brain coral bommie. This was nice, there was a large turtle asleep under it. Once I went right around this, I swam over to the main reef for a short time before ascending. I had been down only 25 minutes, but as I could no longer see or hear Kelly in Thunderbird 2, I was worried she might not know where I was. This was a very good dive, well worth doing again. This spot is outside the reef and on the southern side of the entrance channel. This time we both dived and we anchored Thunderbird 2 in about 9 metres a short distance off the reef wall. This was roughly where I started my channel dive. We have a very heavy anchor and chain and we also wrapped the anchor around some dead coral. We headed out to the north to 15 metres. There was a large coral bommie here which we went around. There was a turtle there as well as quite a few larger reef fish. We headed back to the reef by heading south-east and then along the wall to the anchor (to check on it). As we approached the anchor, a very large shark swam past us. It was a species I have never seen before. I did not have any shark books with me on this trip, so I am not sure what it was. It may have been a nurse shark (not grey nurse shark). From the anchor we went out to the west. There were some more bommies here in about 13 metres. We headed to the south-west till we hit the wall again. From here were followed it back to the north to the anchor. On the way we saw a large eagle ray. This dive had lots of unicornfish, surgeonfish, a few species of anemones and clownfish, trevally, red bass and more. It was an excellent dive, with visibility of 25 metres or so. This site is inside the lagoon, a few hundred metres from the entrance channel. We anchored next to this cabbage coral bommie. It is about 40 by 30 metres in size. We went around it on the (very fine) sandy bottom, There is a shear wall on the north-western side, the rest of the bommie has cabbage coral. There are also some smaller coral outcrops off this bommie. There were lots of normal tropical species, with some nice Moorish idols, bannerfish, blind shrimps and gobies, butterflyfish and more. The sand was very fine and when stirred up it created a fog. It was very milky because of this. 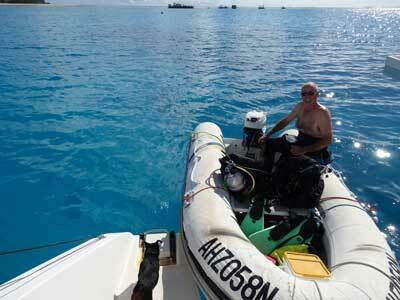 A nice dive site which was very relaxing as we did not need to worry about Thunderbird 2 drifting away. 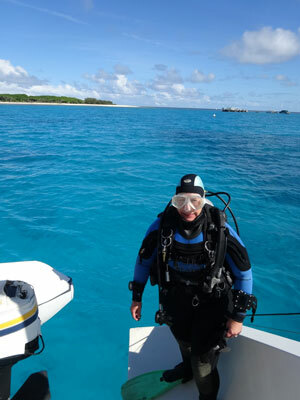 We spent five nights at Lady Musgrave Island, doing one dive each full day we were here. We were going to stay longer, but the weather was forecast to turn bad so we had to leave. We were going to come back out again once it cleared, but it did not and the forecast was no good for the next two weeks. On the way back we also did not have good enough weather to visit. We needed at least four good days to make it worth sailing out there.